Back in January, the Internal Revenue Service made it clear that taxpayers had until April 18 to file their federal income taxes. Apparently, Apple’s calendar didn’t get the message. Instead, the calendar, which can automatically fill in U.S. holidays and other notable days on iPhones and other Apple devices, continues to show “Tax Day” as April 15, the traditional deadline for filing taxes, The Cleveland Plain Dealer points out. 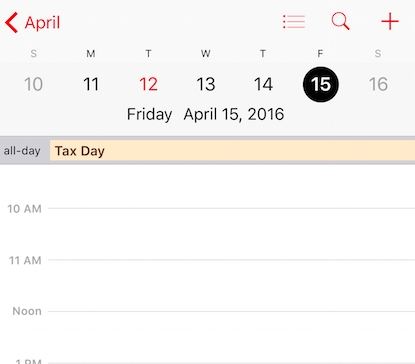 April 15 is not “Tax Day” in 2016, even is your iPhone says it is. Only this year, April 15 is being used to observe Emancipation Day — which falls on Saturday, April 16 — a legal holiday recognized in Washington D.C., where the IRS is located. Because the IRS and other government agencies will be closed on Friday, the deadline for filing taxes has been pushed back to the next business day, Monday, April 18. While the federal government is giving taxpayers a few extra days to submit their filings, it’s important to also check your state filing deadline. Most states have pushed the deadline to April 18, as well, but a few have actually tacked on an additional day. Maine and Massachusetts are giving taxpayers until April 19 because of Patriot’s Day.